Fortaleza is a major city on the northeastern coast of Brazil. It's also the capital of the Ceara state and is one of the largest cities in the country. It's become a bit of a party town and there is a vibrant nightlife scene. The city is known for its local comedians, forro music, and dance. 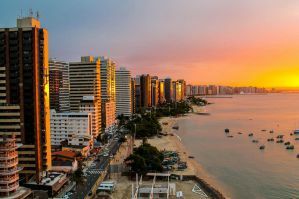 Fortaleza is a bit of a package tour destination for local Brazilians, but it is also popular with international travelers. If you're traveling to the area in January then reservations are a must as this is when many Brazilians take vacations. It might be possible to find discounted rooms between the months of September and November as well as March through May. There are a decent number of good hostels around town. Some are more social than others and there are several party hostels that take advantage of Fortaleza's party scene. Whatever your interest and travel style, you're sure to find something interesting. 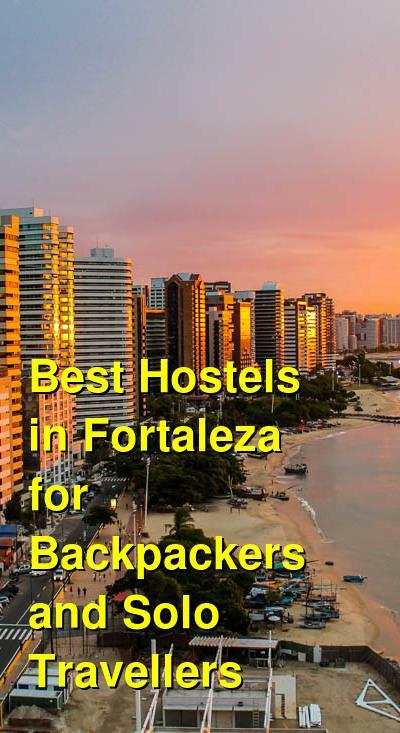 How much do hostels in Fortaleza cost? The Sea Dragon Hostel is a favorite hostel for backpackers and budget travelers in Fortaleza, Brazil. It's located within the heart of the city and offers access to many of the best beaches and popular bars and activities in the area. It's just a few blocks from the Central Market Fortaleza and Feirinha Beira Mar. This is a great area to explore and there is impressive architecture and great shopping nearby. There's also a vibrant nightlife scene nearby and many opportunities to see shows or cultural performances. This is a wonderful hostel with great staff and owners. They are helpful and friendly and can tell you all about the area. It's also a clean and modern place to stay with comfortable beds and breakfast included in the price of the room. The dorms sleep up to six people and there are male only, female only, and co-ed rooms available. A fun party hostel for solo travellers and small groups. Full Sail Hostel is another popular hostel in Fortaleza. It was started by backpackers and it's perfect for independent and young travelers who want to relax in a fun environment where it's easy to meet other guests. You'll receive a free caipirinha every evening and there always seems to be something going on. The staff plan all kinds of activities and events for guests, so if you want a ready made group of friends, then this is the place to stay. Days here are mellow and relaxing and nights are fun and a bit loud. The rooms open right on to the bar, so if you're not looking for a social atmosphere, then you'd probably be happier staying somewhere else. The hostel is located in the heart of the city and is just five minutes from Beira-Mar, where you can enjoy great Brazilian food, nice beaches, and easy access to public transportation. The surrounding area is known for its nightlife and cultural scene, so it won't be hard to find something to do. The staff here are made up of locals and international workers. They speak English, Portuguese, and French, and they can help you with any questions you might have. Breakfast is served every morning. The hostel has dorms that sleep four, six, eight, or ten people. Refugio Hostel is the perfect place for travelers who want a relaxing and peaceful setting. It's a clean and comfortable place to stay where it's easy to meet other international travelers, but it does not have they party atmosphere that you might find elsewhere. The staff are great to chat with and there is usually a diverse group of guests. The hostel focuses on environmentally friendly practices including a solar heater and a water reuse system. It's a modern and well furnished hostel and you're sure to enjoy your time here. There are dorms that sleep anywhere from two to eight people. There are also three private suites that have a lot of room and plenty of privacy. The hostel has two outdoor terraces where you can hang out or enjoy the professional stone barbecue. There's also a nice garden with hammocks for lounging. A shared kitchen makes it easy to prepare your own meals and there's a television room if you want to hang out inside. The hostel is about a fifteen minute walk from the city center and it is a convenient place to spend a few days.